The J-Bay Open, stop No. 6 of 11 on the 2014 Samsung Galaxy ASP World Championship Tour, got off to an action-packed start today in some of the best conditions on Tour so far this year. Jordy Smith (ZAF) scores the first Perfect 10 of the competition. The event ran through Round 1 and the first four heats of Round 2 in excellent five-to-seven foot (1.5 – 2.1 metre) surf at Supertubes. Defending event winner Jordy Smith (ZAF) made the most of the outstanding conditions and was the standout performer of the day. 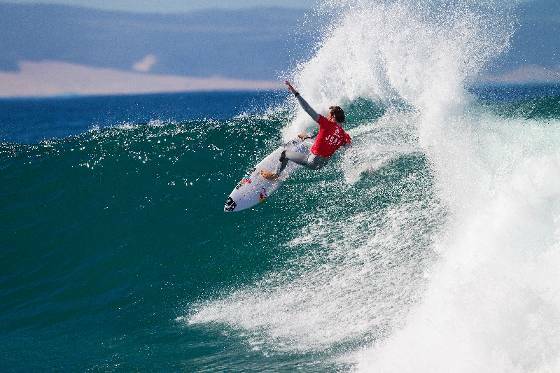 The South African secured the first perfect 10 of the competition as well as the highest two-wave heat total of the 2014 season (19.80 out of a possible 20) to keep the local crowds enthralled. The first heat of the competition saw a regular-foot battle, with Mick Fanning (AUS), Sebastian Zietz (HAW) and Dion Atkinson (AUS) each finding a wave quickly after the horn. The Hawaiian got the best of the opening exchange with a 6.00. The reigning three-time ASP World Champion and two-time J-Bay Open winner stayed busy throughout the heat, eventually posting a 7.00 and 6.43 compliments of his signature forehand attack. Fanning continued to strengthen his lead over his younger competitors, posting the first excellent ride of J-Bay Open competition with an 8.00. Fanning’s 7.00 and 8.00 saw the two-time event winner snag a convincing Round 1 win. Joel Parkinson (AUS), two-time J-Bay Open winner, kicked off Round 1 heat 3 with his classic precision. Goofy-footers Kai Otton (AUS) and wildcard Glenn Hall (IRL) made the most of the following sets but it was Otton who emerged as the in-form athlete of the heat, committing to each turn with power. In the final moments, the two Australians went wave-for-wave, each pulling into barrels with expert finesse. Otton tucked into a tight tube, while Parkinson rode triumphant from a bigger barrel that broke behind him. Both surfers scored nine-point-range rides but Otton’s bottom score carried him to the end as the heat winner. Parkinson, current ASP World No. 5, went on to surf again in Round 2 where he got the better of Brett Simpson (USA) to avoid elimination and move through to Round 3. Round 1 Heat 6 saw 11-time ASP World Champion Kelly Slater (USA) take on Tour rookie Mitch Crews (AUS) and local surfer and event wildcard Dylan Lightfoot (ZAF). Kelly Slater of USA (pictured) won his Round 1 heat at the J-Bay Open defeating event wildcard and local talent Dylan Lightfoot (ZAF) on Thursday July 10, 2014.The J-Bay Open, stop No. 6 of 11 on the 2014 Samsung Galaxy ASP World Championship Tour was called ON today for Round 1. Crews opened with a solid wave, but Slater quickly followed suit, taking on Supertubes with ease. He tucked into tubes and executed sweeping frontside hacks. About 20 minutes in, the 19-year-old wildcard dropped into his first wave, unleashing powerful turns armed with local knowledge to take second place. Crews was left trailing and, with just over five minutes left, saw an end to his Round 1 effort when he broke his board on the lip of a smaller wave. Slater took the win and advanced straight to Round 3. Backsiders Nat Young (USA) and Miguel Pupo (BRA) took on Aritz Aranburu (ESP) on his forehand in Round 1 Heat 7. Supertubes is traditionally a tricky wave for the backhand surfers and Fiji Pro runner-up Young was put to the test today as he made some uncharacteristic falls. Aranburu struck first clocking two keeper scores early on in the heat, unloading a series of power gouges and carves before pulling into a deep tube and being rewarded with an excellent 9.03. Young and Pupo were both left searching for near-perfect scores to turn the heat and fell short leaving Aranburu to claim his second Round 1 win of 2014. Round 1 Heat 10 had barely begun when local favourite and two-time J-Bay Open winner Jordy Smith (ZAF) racked up 19.30 points on back-to-back waves. Smith boasted a deadly combination of local knowledge, the athleticism to take on Supertubes’ fast, steep waves, and the pressure to bring in a good score after an early season of mixed results. Australia’s Owen Wright answered back, scoring a combined 17.03 and yet by the midway point he and Jadson Andre (BRA) still needed nine-pointers to close the gap. With fewer than 10 minutes on the clock Smith was awarded the first Perfect 10-point ride of the event for seamless carves, a massive floater and a final tube ride. Smith takes a convincing win and confirms his prowess on home turf. “To have the contest back in Jeffreys Bay is a brilliant feeling,” said Jordy . “Not only for the surfers but also for the local people. “All the kids get to see their idols surf this wave. This is one of the best righthand points in the world and it’s an incredible thing that they’ve brought this event back. Jeremy Flores (FRA) opened Round 1 Heat 11 with a couple of minor scores, followed down the point quickly by John John Florence (HAW) and Bede Durbidge (AUS). Florence finished his ride with the aerial of the day, a massive fin throw reverse while Durbidge powered his way down the line with searing carves and turns to take an early advantage. Florence backed up his opener with a fast and furious barrage of carves and lip bashes that saw him leapfrog Durbidge for the lead and a pass directly to Round 3. Durbidge and Flores will surf again in Round 2 where they will face Matt Wilkinson (AUS) and Sebastian Zeitz (HAW) respectively. Local wildcard Dylan Lightfoot (ZAF) started strong in the opening heat of Round 2, keeping busy to take an early lead over current ASP World No. 1, Gabriel Medina (BRA). Dylan Lightfoot of Jeffreys Bay (pictured) surfed two rounds of competition at the J-Bay open but was eliminated in Round 2 on Thursday July 10, 2014. Lightfoot entered as a wildcard placing second to Kelly Slater in Round 1 before being defeated by ASP World No. 1 Gabriel Medina in Round 2. The J-Bay Open, stop No. 6 of 11 on the 2014 Samsung Galaxy ASP World Championship Tour was called ON today for Round 1. Both of the young phenoms were working with smaller waves but were able to take advantage of the crumbly surf. Medina pulled a flawless air reverse, which Lightfoot followed up with a seemingly effortless air. In the final minutes, Lightfoot looked to regain the lead, but needed an excellent score. Medina’s efforts were rewarded and he edged out the up-and-comer, advancing to Round 3 while Lightfoot leaves the competition in equal 25th place. “I knew that the heat against Dylan Lightfoot was going to be a tough one, local guys at every event are always hard to beat,” said Gabriel Medina. “I tried to be smart and get the big waves. This board goes well so I was able to do some big turns.